Along with posting every day on here for blogtober, I'm also posting every single day this month on my Instagram account. 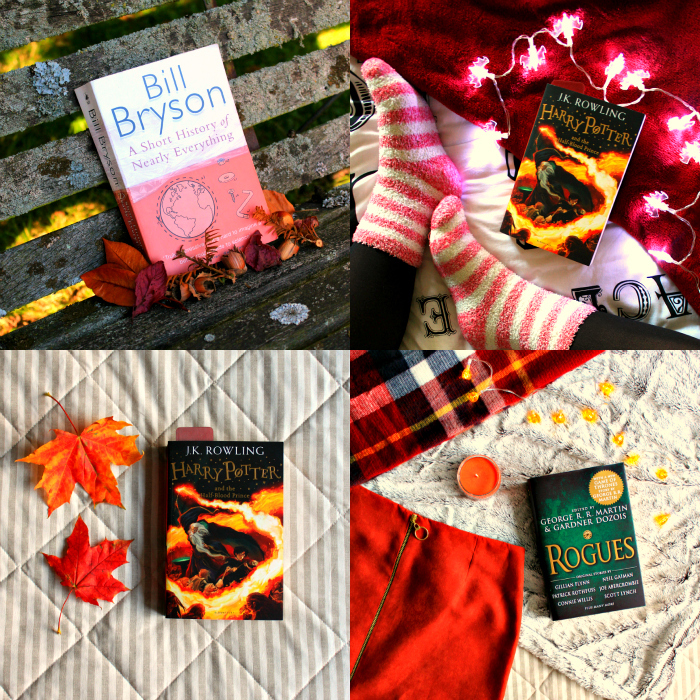 I really enjoy putting together and editing photos for Instagram so I thought I'd share some of my recent photos with you and some tips on getting the most out of your book photography! This post is pretty rambly and I'm definitely no photography expert, it's just something I really enjoy doing, so I hope you find it a little helpful or at least enjoy the photos! As you'll notice in the photos above I've been going with a bit of an autumnal vibe for quite a few of my photos because I've been so inspired by the amazing colours this time of year brings and looking at these photos makes me feel warm and cosy even as it's getting chillier outside. A lot of Instagram accounts have an overall 'theme' which is reflected in all of their photographs, giving their feed a clean, cohesive look; whether it be bright and colourful or muted and cool toned. I think these accounts look amazing but I personally would find a specific 'theme' a bit too limiting. However I am quite consistent in the style of my photographs; most of my photos are colourful, highly saturated flatlays with a bright white-ish background. I'm not saying that this is the best style it's just something I personally really like the look of and find fun to play around with. I busted my phone camera a while ago, and although it has been repaired the quality is just nothing like it was, so I take pretty much all of my Instagram photos with my Canon EOS 600D. You definitely don't need a fancy DSLR to take good photographs but it's just what I enjoy using and I personally don't find it too much hassle. I tend to dedicate some time to take a lot of my blog and Instagram photos in bulk because it's easier to transfer and edit them in bulk and I just find that once I get started the creativity just comes out and I want to keep going. I really love using props in photographs because I think they can really boost an image and add a lot to the composition. I pay quite a lot of attention to the colour when it comes to adding props as I take quite a lot of photos against a light background and I like the colours of the photo to be cohesive and also stand out. I always start with the book, which is often the main object of the photograph. I then grab props from anywhere that comes to mind and keep arranging them in different ways and taking lots of shots so that I have a few to choose from when it comes to editing. It's kind of hard to explain this process but it's something I find really fun and have just learnt to improve as I go along. I then transfer the images over to my laptop and edit them using Picmonkey, which is free and has everything I personally need and a whole lot more. I don't do a whole lot in terms of editing, I mainly just resize the image, up the brightness, highlight, saturation and temperature a little and they're ready to transfer over to my phone and post on Instagram! This might sound like a lot of work just for Instagram and I'm definitely not saying you have to do all this, I just really enjoy the whole creative process and sharing the images I've created. My account is by no means the most perfect or the most popular but I honestly don't care about that, I care about creating something that I'm proud of. There really is no right or wrong when it comes to Instagram. Although you might feel intimidated by beautiful accounts with masses of followers (I'm not referring to myself by the way haha, as if) you've got to remember that perfection and likes are not the goal here. It's about expressing your creativity through photography and creating an image that you enjoy. I hope that you've enjoyed these little ramblings about Instagram and if you'd like to follow me on there then you can find me @sarahschapter. Do you have Instagram? If so please comment with your username, I'd love to check out some new accounts! Great post and great pictures. I don’t have Instagram, but I like taking pictures. I mostly take pictures of nature and my dogs. My book photos have never turned out very well. Aw, your bookstagram is lovely! I'm actually very jealous - I WANT TO BE INSTAGRAMMING EVERYDAY - but my phone isn't a smartphone (IKR???) and my tablet broke... and then I bought a new tablet, but it won't allow me to access instagram. SO MUCH DRAMA! Urgh. Anyway, that Harry Potter picture with the socks made me long for the days when I curled up with a good book on a Saturday night... now I have to spend time with the boyfriend. THE HORROR! 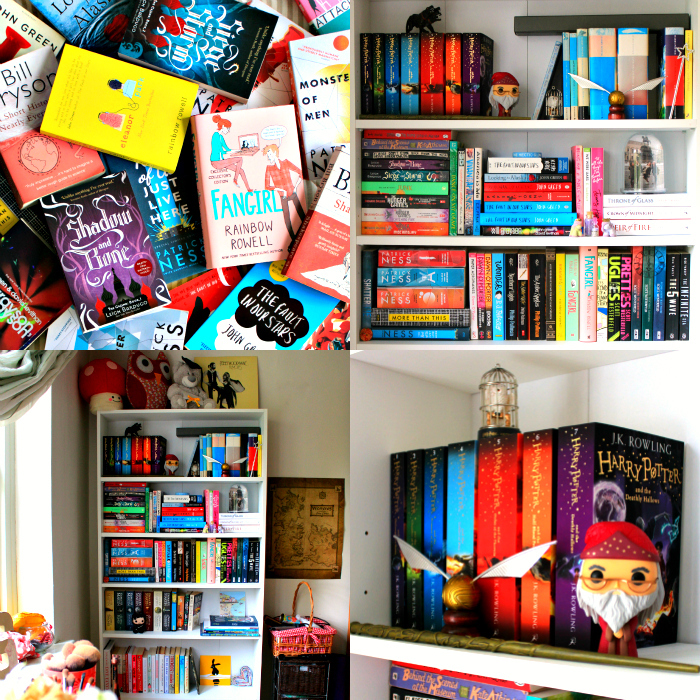 Ooh... i love reading how other people bookstagram. Thank you for the tips. :) I am bookishaddicted on ig. Feel free to say hi.